Rosemary is pine-scented herb, that grows into a small shrub that can reach up to four feet in height in an ideal climate. The plant produces flat, needle-like leaves that are about one-inch in length, green in color with a silver-grey sheen on the underside. 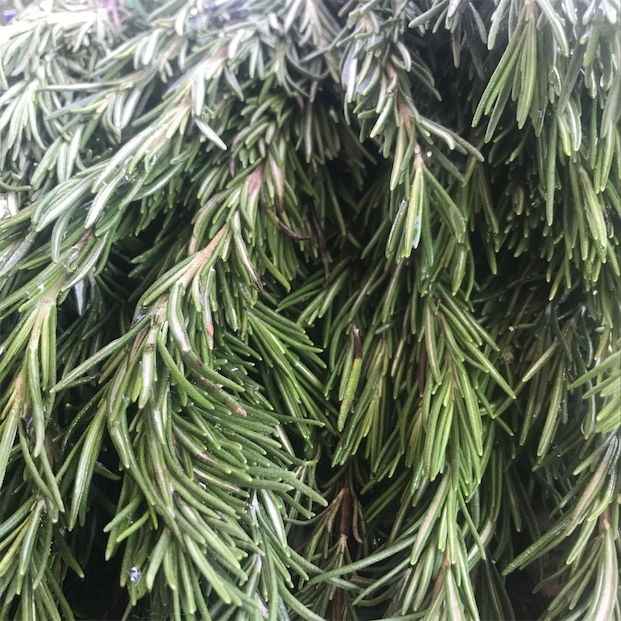 Rosemary’s needle-like leaves grow in thick rows, straight upward on multi-branched, woody stems. The fragrance is very pungent, with a bitter and astringent, pine-like taste. When mature, white or blue, two-lipped flowers bloom at the tops of the stems. Rosemary is generally harvested prior to flowering. Rosemary is an evergreen herb, botanically classified as Rosmarinus officinalis. 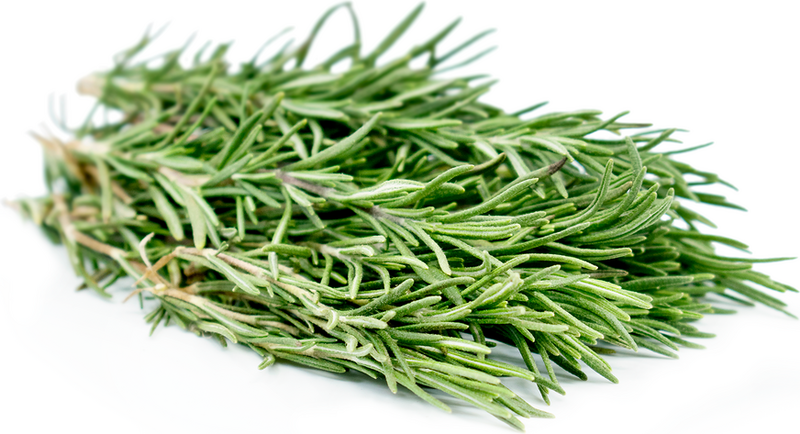 Rosemary is grown not only for culinary use, but also for its use as an aromatic and medicinal purposes. 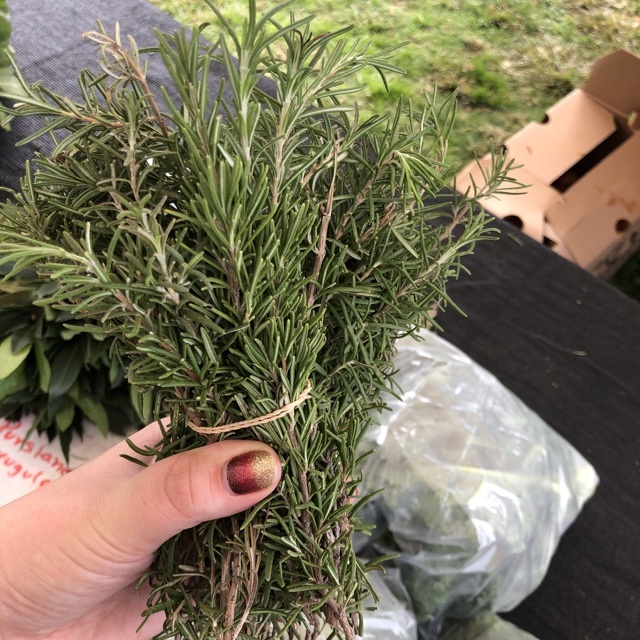 Rosemary is in the same family as mint, the Labiatae family; however, some botanists believe it is more closely related to sage, and should be in the Salvia family. Rosemary is a good source of vitamin A and beta-carotene, as well as the minerals potassium and calcium. The volatile oils in Rosemary contain natural compounds like pinene and camphene, which are terpenes that give Rosemary its intense aroma, and other phytochemicals such as cineol. These compounds give Rosemary anti-inflammatory, antibacterial and anti-microbial properties. Rosemary has a wide variety of uses. It is a potent herb, and should be used sparingly. In culinary applications, Rosemary pairs well with other herbs, but can be used lightly on its own. After cleaning and drying, remove the herbs by holding the stem at the top and running your fingers along the stem backwards. Finely chop Rosemary and add it to eggs, cheeses, and roasted potatoes. Use it to flavor stuffed meats or chicken, and vegetables. Add fresh sprigs of Rosemary to soups and stocks for its aroma and flavor, removing the stems at the end of cooking. The astringent nature of Rosemary makes it an ideal herb for flavoring fatty meats like lamb or oily fish. Rosemary is a common herb for flavoring breads and savory muffins. Flavor vinegars and oils with sprigs of Rosemary, this also preserves the herb. To store, keep fresh sprigs of Rosemary wrapped in a damp paper towel or in ice cube trays filled with oil or stock for future use. Dried Rosemary will keep for up to six months when stored in an airtight container. 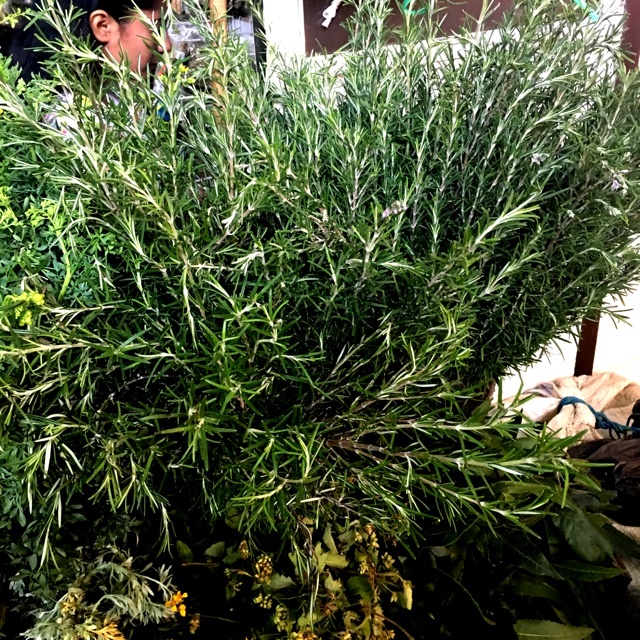 In Spain, Rosemary is revered and is thought to have been the bush referred to in the Bible that gave shelter to the Virgin Mary, and it is used as protection from evil. During the Tudor reign of the 15th and 16th centuries in England, Rosemary was used in wedding bouquets as a sign of loyalty and love. The herb’s association with remembrance comes from its use as a medicinal herb to enhance one’s memory. Rosemary sprigs were worn as a crown by scholars and students. Since ancient times, it was customary at funerals to present sprigs of Rosemary to mourners, as symbols of remembrance. Rosemary is commonly used for its pungent aroma in sachets, bouquets and wreaths. Rosemary is native to a region that stretches from the Mediterranean to western Asia, and particularly favors the coast.  Rosemary is now considered a naturalized plant in the temperate regions of Europe and the United States, after herbs were introduced by travelers and explorers. Two other recognized species of Rosemary: R. tomentosus and R. eriocalyx, can be found in the herb’s native range. 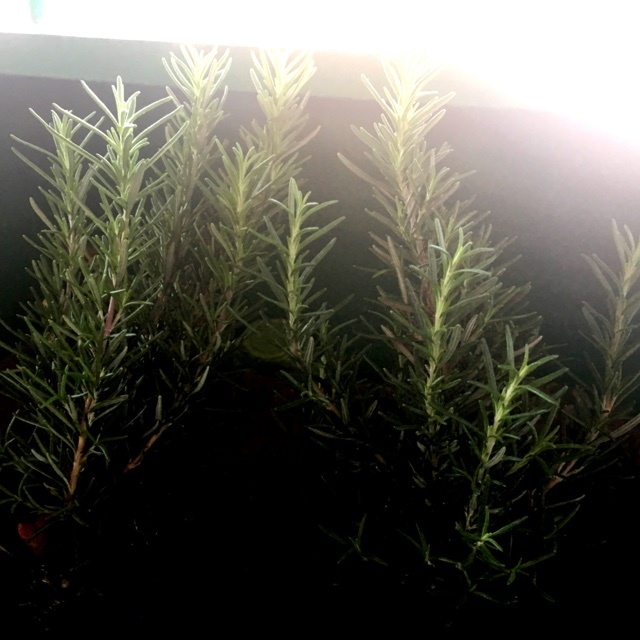 Throughout history, Rosemary has had a place in the kitchen and throughout the home. The aromatic herb was an ingredient in Eau-de-cologne, a scent favored by Napoleon Bonaparte and used throughout 18th century Europe. The essential oils obtained from Rosemary were thought to have first been extracted in the 14th century when it was used to make “Queen of Hungary water” a popular cosmetic for the time. Rosemary grows well along the coast lines; its botanical name is derived from the Latin words ros for ‘dew’ and marinus for ‘the sea’. The ‘dew of the sea’ grows well despite the salty air of coastal climates. It thrives in warmer climates and is often used as an ornamental shrub. Recipes that include Rosemary. One is easiest, three is harder. 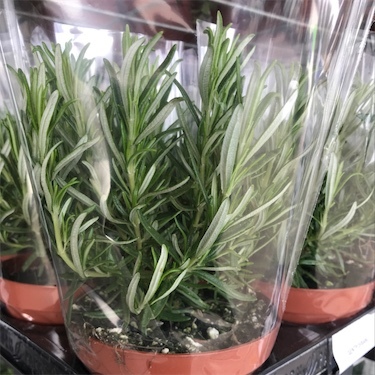 People have shared Rosemary using the Specialty Produce app for iPhone and Android. 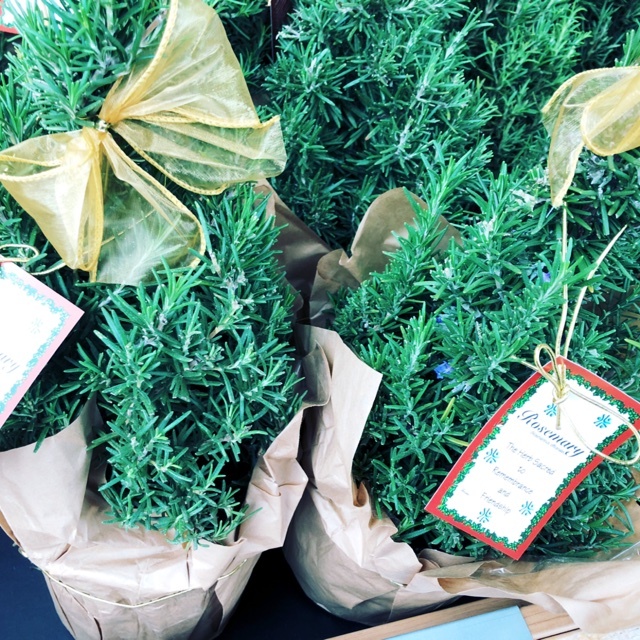 Sharer's comments : Rosemary spotted at Leucadia farmers market . Fragrant and fresh! Sharer's comments : Rosemary spotted at Trader Joe's. This Rosemary "tree" is both festive and functional in the kitchen! Sharer's comments : Rosemary spotted at First Alternative Natural Foods Co-Op. Sharer's comments : Rosemary spotted at mercado benito Juarez. Sharer's comments : Rosemary spotted at Mercado Hidalgo.